1. Allow to unsalted butter to set to room temperature. 2. Apart from the fruits, mix the other ingredients to a consistent batter in a mixing bowl. 3. Add in the fruits to the batter mix and stir evenly. 4. 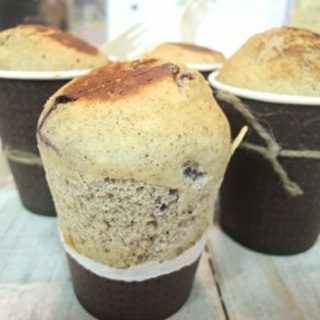 Fill each paper cup to 60% level with the mixture. 5. Arrange the cups in a deep soup pot, roast with low fire for 25 minutes. 6. Invert the cupcakes and allow the top surface to be further roasted to a crispy brown texture.